 Are you on a budget?  Want to dress up but not go the whole hog?  Are you worried it may not fit?  Are you organising a hen or stag do - birthday or anniversary celebration a leaving do or a corporate event and want a hassle free solution? Then why not rent a one size fits all - unisex tabard or cape from us (taken from our Knights & Musketeer collection - so no compromise on quality). Belt or ties provided with tabards to adjust size. Matching headpiece provided & associated prop. Same service - same quality at a fraction of the cost £25 inclusive of delivery & collection subject to minimum order value. We offer packages and discounts for groups of 10 and over and have a number of flexible options for your event. 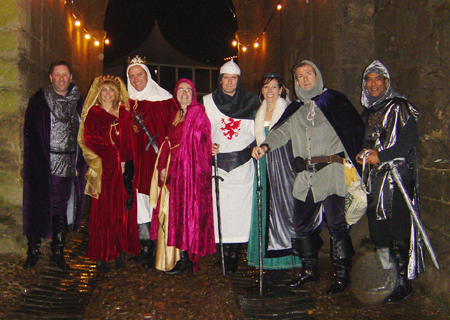 We deliver & collect costumes free from Warwick Castle, Coombe Abbey or a hotel of your choice. ( within a three mile radius - subject to a minimum order value). Telephone us to discuss discount options for your group, Hen party, or corporate event!